I am really into strolling around old cemeteries. My mom is too, and she brought me up to appreciate the interesting history and beauty that cemeteries have to offer. We visited a really old Oregon cemetery yesterday, and walked through, hunting for the oldest grave or biggest family plot. I had my camera with me, of course, and snapped this photo of some orangey yellow lichen peeling off the top of one of the old tombstones. Nice macro! Love the color of the lichen. Oh that's cool. It almost looks like rusted metal. Nice shot! I love the texture. Old cemeteries are very interesting. 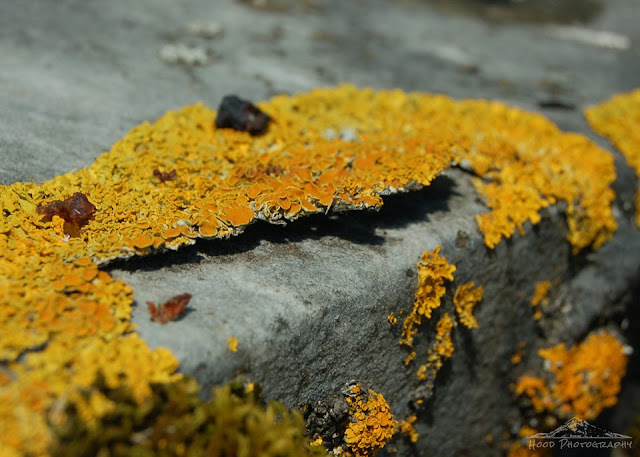 The lichen almost looks like a squashed sunflower. Very bright. I love to read some of the words that are added to tombstones. Some are very funny and others, sad. Lovely color and texture. I love old cemeteries too. I love walking through cemeteries. when I find the really old graves I wonder what kind of stories they could tell. Impressive shot! Like the textures and coloring. I don't think I'd recognize lichen if I saw it.